As facilitators, we always hope that the virtual classroom platforms we're using will work flawlessly during our live training sessions. Realistically though, many things can and will go wrong with learning technologies. The key is to be prepared. And this infographic can help! Based on the 4-step disaster recovery process taught in our popular Master Virtual Producer (MVP) Certificate course, this infographic can help you recover from almost any common technical challenge. 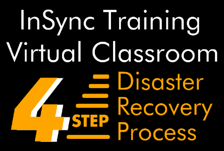 Follow the 4-step disaster recovery process presented in this infographic, and you'll be able to gracefully handle just about any virtual classroom technical challenge that you encounter. To download the infographic, please click here. To read more about this process in real life, check out this recent blog post, So This Happened...Recovering From a Webinar Fail, by Jennifer Hofmann.